We are delighted to announce our new Christmas Hire + Style service exclusive to our Manchester and Cheshire customers. If you're hosting Christmas at home this year and looking to create a striking tablescape for your guests, why not take advantage of our new flexible and cost effective hire service with no minimum order quantity and save up to an 80% discount on the retail price of each item. We are also able to offer FREE delivery and collection to Chorlton, Whalley Range, Didsbury and Stretford postcodes as well as FREE in store collection should that option be more convenient. Standard drop-off and collection for Manchester postcodes and Oldham, Stockport, Wilmslow, Knutsford and Alderley Edge is charged at £20 for the round trip. Choose from tableware and glassware from our core Danish collections including Botanical, Rustic, Industrial and Minimalist. View the ranges HERE. A minimum spend of £75 pre-order applies in addition to a 20% refundable deposit for loss and breakages and a 10% cleaning fee. All orders will be delivered between Monday 17th and Thursday 20th December and will be collected on Wednesday 2nd and Thursday 3rd January. You will be contacted in advance to arrange a suitable time and date. Alternatively, you can collect and return items to order store, please see our Christmas Opening Hours for details. *Please note the last day to book our Christmas Hire Service is Friday 14th December. We strongly advise booking ahead as limited availability may apply. For Christmas 2018 we are exploring a modern-rustic themed Christmas table that fuses elements of Scandinavian and Boho interior trends. Working with a romantic colour palette of dusky pinks, blush, rose and mauve paired with dove grey and flickers of brushed metals such as copper and antique gold, we are able to achieve a warm and inviting table scape that magically blends traditional and contemporary concepts. Dried flowers and botanicals add a gorgeous rustic element, think Scandinavian lake-cabin style ! Just like we referred to aged-looking metals earlier in the blog post, the same rule works for foliage. Greenery such as silver-toned ‘Eucalyptus’ looks stunning displayed as table trail and ‘Honesty’ with it’s pearly paper-like seed cases looks so elegant displayed in centre vases. Perhaps, try using the famous festive flower mistletoe, displayed and attached with string to each Christmas cracker; whoever wins at pulling is in for a Christmas treat ! Why not try experimenting with objects you wouldn’t normally use on a table setting ? Patterned tiles such as the ‘Vintage Metropolis Star’ tiles (samples from 99p) work really well as centre pieces for displaying water jugs, wine bottles, condiment servers and festive ornaments. They also add a contrasting yet complimenting ceramic visual to a matching dinner set. If your table space allows for a large centre pieces, giant metal star lanterns in brushed gold or zinc make a dramatic impact and are in-keeping with salvage element of the modern-rustic theme. Perhaps, your Christmas menu is just as impressive as your table setting so why not print your menu of texture paper (brown or white kraft paper work best) and display in a double-sided antique frame. Introduce elements of nature such as feathers and pinecones and add your own handmade touch by dipping the tips in festive glitter ! Candle light will make your setting look warm and inviting. Depending on how much space you have, try experimenting with a huge candelabra centre pieces, preferably dripping in wax for a truly rustic vibe ! Or if you don’t have a huge amount of table space, try using lots of different heights of candlesticks and tea lights in both glass and ceramic varieties to give the table plenty of soft, glowing light. Again if you’re lacking on actual table space, why not create your display from above ? Experiments with different shaped paper snowflakes and stars that can be easily attached to ceilings without any preparation. If you’re feeling more experimental, insert ceiling hooks into the joists to display heavier festive accessories such as glass lanterns, metal stars, candle holders and even botanical displays ! 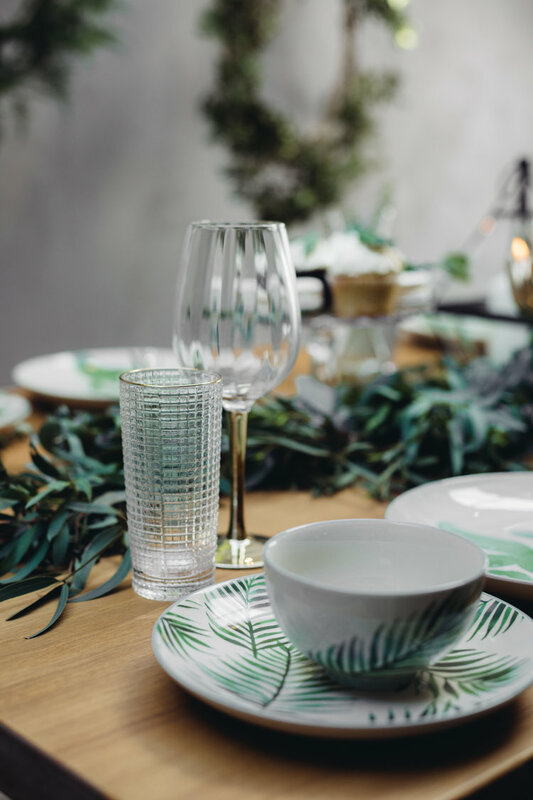 Don’t forget that Object Style offers a Christmas tableware and glassware hire service, so you can create a striking tablescape just like these inspiring images for a fraction of the cost ! For more information click here. Welcome to Object Book Club, a new chapter of our shop that is launching this Autumn ! Our new members-only book club meets every fourth Wednesday of the month at our Chorlton store for an open group discussions about the book we’ve read that month. At each meet-up we will informally discuss your emotional response to the book, characterisation, themes, most memorable parts (descriptions/dialogue), strengths/ weaknesses and your opinion on the whole. Due to the intimate space of our store, Object Book Club is limited to just 10 spaces per session and strictly by advance bookings only. Each session will include complimentary hot and cold non-alcoholic drinks and nibbles, an option to purchase the book direct from our store and an exclusive discount voucher that you are welcome to use in our shop or online. Object Book Club is a great way to meet new people and enjoy a friendly mid-week social event for book lovers. Please find information below about our schedule and details of how to book your place. Wednesday 26th September, 7pm - 9pm. Wednesday 24th October, 7pm - 9pm. Wednesday 28th November, 7pm - 9pm. Wednesday 19th December, 7pm - 9pm. Each new book for the next book club meet-up will be announced at our first event (Wednesday 26th September) or for new members looking to join the new read will also be announced on our Instagram and via our newsletter shortly after this date. Option 1 - Autumn membership (4 meet-ups) + all book inclusions. Includes a copy of each book we will be reading at the 4 book club meetings (please note that books must be collected in store prior to the first event). We can offer local drop off for Chorlton and Whalley Range members. Secured place at the monthly book club meeting. Unlimited drinks + nibbles at the event. 15% discount in store or online for a one-off purchase per month. Price £70 - click here to purchase. Option 2 - One-off membership for first event (26/09/18) + one book inclusion. Includes one copy of the book we will be reading that month (please note that books must be collected in store prior to the first event). We can offer local drop off for Chorlton and Whalley Range members. 10% discount in store or online for a one-off purchase to be used within one month. Price £20 - click here to purchase. Price £5 - click here to purchase. Finally our store address is - Object Style, 519 Barlow Moor Road, Chorlton, Manchester, M21 8AQ. Transport - Nearest tram stop - Chorlton. Busses 23, 86 and 85. This was our second time visiting San Francisco and I have to be honest in saying I was dubious about spending time in the city after our first experience. We last visited as part of our honeymoon in 2015, naively we didn’t do enough research so our time wasn’t spent as very well and we came away like we hadn’t seen what so many others had been sure we would love. San Francisco is quite a tricky city to navigate not only can the mood drastically change from street to street and due to those infamous hills, it’s not exactly an easy place to walk around. So this time, I made it my mission to adopt a militant style approach to research and planning to ensure we got the most out of our 48 hour visit and this time I’m converted, I get what all the pro San Fran fans were talking about ! Personally, my favourite thing about San Francisco is its nightlife; buzzing, extrovert and raucous. We danced in dingy, sticky carpet dive bars, dined in extraordinary, gastronomical restaurants that hid behind unmarked, graffiti scribbled doors, saw the bright lights of the city scape from rooftop cocktail bars and watched impromptu Sunday afternoon jazz in the backstreet bars of The Haight. By day things are a little calmer, sort of, though don’t be surprised to see someone just casually taking a naked stroll through the city, as long as they have a permit parade it’s completely legal to do so in California ! For interesting street murals that speak powerful political messages head to the Mission, home to San Francisco’s largest Hispanic community and make it your mission (excuse the pun) to eat Mexican around here ! For independent shopping small boutique stores head to Hayes Valley, there is a great selection of coffee houses and watering holes in this neighbourhood too. Read on below to discover my highlights of San Francisco. If you’re looking for some respite away from the noise of the city, visit the tranquil Japanese Tea Garden, the oldest in the whole of the United States. Talk a walk along the arched drum bridge or step across the stones in the stream, take in the scent of native Japanese plants, finishing with a visit to the harmonious Tea House and enjoy a traditional tea ceremony tasting. Situated in Golden Gate Park, the de Young museum is worth seeing for it’s impressive architectural structure as it is for eclectic collection of 17th-20th American and African art. An independent lifestyle store, owned by a collective of female designers. Each piece of clothing, jewellery, textile art and ceramic is handmade in California. Ringing true to the phrase, the best things come in small packages, they really do in ceramicist Melissa Rice’s micro pottery shop. Super luxe basics and wardrobe staples for men and women. Oak + Fort also carry an interesting and affordable collection of jewellery and leather goods. In the UK we call them back street boozers, in the US they call them dive bars, equally you really shouldn’t like them but you just can’t help it ! You can’t miss the glowing neon pink signage with the camp Club Tropicana-esque cocktail, this place is loud, crowded, a bit smelly but incredibly intriguing. The pretzel knot with beer cheese fondue. I dream about it daily. Go visit and order this plus one of the 150 world beers + ciders available. Widely regarded as one of America’s most influential bakeries, Tartine is a heavenly French-inspired bakehouse which has been praticising the art of bread making for over 20 years ! And they’ve got it just perfect, worth the queue, worth the price tag, smells as good as it tastes. Hiding behind a non-descript door (like all the best places are right ?) is Foreign Cinema, a large scale restaurant adorned with festoon lighting and set against a gigantic cinema backdrop showing guess what ... arty, independent, foreign films ! It boasts an extensive small plates menu from around the world and it is here I became a lover of sprouts. Brussel sprouts in California are big business, they are anything but boring and boiled and definitely not just for Christmas when you’re Stateside. Try them ! Head to their Mission location, my personal favourite out of their 4 coffee bars in San Francisco. Obviously the coffee is amazing but the setting with its huge light-filled crittal windows (definitely worth an Instagram post) , pared back ply wood interior and handmade ceramic mugs make a lovely surrounding to enjoy your choice of bean. Two things to be sure to pack for San Francisco are a lightweight jacket and a pair of sneakers. Temperatures change by the street and heels + hills are an absolute no no ! It was such a close call for us to either revisit Portland since falling in love with the city on our Honeymoon in 2015 or give it’s Northern cousin Seattle a try. Obviously we decided on the latter and I’m really glad we did. Seattle is a much bigger city than what we had anticipated but still manages to have a homely, small-town feel and the locals are the friendliest bunch of folk we met out of all the locals we came across on our trip ! There is a great foodie scene in Seattle, you really are spoilt for choice for artisan eateries, locally brewed beer, cider even wine and fresh produce farmers markets. What also really surprised me about Seattle was how pretty it’s suburban neighbourhoods were; Fremont for example, looks out at a picturesque harbour speckled with peacefully bobbing boats and Ballard’s leafy streets are dressed with twinkly fairy lights that coil around trees and frame shop fronts. We only had 48 hours in the city to cram in as much exploring as we could whilst battling an out of sync body clock and sleep deprivation (Seattle is 8 hours behind the UK), so we decided to spend most of our time in a couple of areas as oppose to spread ourselves too thinly. I feel like we only touched the surface of what Seattle has to offer and have a sneaky feeling we will return one day (armed with Nytol and severely strong coffee). Perhaps one of things that made our visit to Seattle so memorable was our choice of accommodation. As I mentioned in my previous post, paying for somewhere to sleep for 3 weeks is a big outlay so we tried staying at various different places to stretch our purse strings and also because it’s fun to mix stuff up ! So our shoebox sleepover in a Stranger Things esque caravan in someone’s back garden was a fantastic experience, even if we did need to sleep in 15 layers and take turns to pass through the kitchen area en route to the shower ! Link to the Air BnB here. Okay this place is little touristy but it’s also quite iconic being home to the original Starbucks coffee house, though you’ll be lucky to actually get to see the shop front as masses of tourists flock with selfie sticks desperately trying to get their souvenir shot for Instagram ! Starbucks aside the best stuff is actually inside the market. Wander through crooked corridors and creaky, winding staircases to discover micros cafes, bars and eateries such as The Crumpet Shop and Stroryville Coffee before visiting the famous Farmer’s Market to pick up speciality foods to take home. Perch yourself at Fremont Brewing Company, choose from one of 100 craft beers and ciders and take in tranquil view of the harbour and the impressive skyline of the city. Located in edgy Capitol Hill, Glasswing is possibly one of the best concept store’s I’ve ever visited. Stocking an eclectic mix of homegrown brands as well as Scandinavian designers for men, women and the home, each carefully curated section of the store has been exceptionally well thought out. My favourite part was the vintage roll-top bath alternatively used as a huge planter to pot beautiful house plants within the botanical skincare area. This dreamy, pastel perfect lifestyle store is strangely situated in the financial area of the city though it is definitely worth making that extra effort to visit ! The visuals in the windows and within the store are beautifully designed and make an eye-catching backdrop to house locally made ceramics, jewellery, clothing and stationery. This native inspired indie store was so warm and inviting. Sometimes when shops try to be too many things, their initial intention can get lost and confused but this was totally not the case with Tides & Pines. Part clothing store, workshop space and grocer as well as stocking handmade pottery, native style jewellery, tapestry and more, this neighbourhood haunt was such a good example of what amazing things can be done in such a small space ! My personal favourite was being handed a complimentary glass of locally made, natural wine upon entering the store, I mean what more can you ask for ?! Oh my word this place ! Imagine a little wooden cabin with a kind of built in tiki bar, chintzy faux ivy and red roses twining around iron fixtures and 1920’s silent movies playing via a projector and this is Little Tin. Also offering the sweetest table service and the best decadent cocktail menu too. ‘Celebrating Italian aprivito in a jewel box space’, Barnacle is a lovely little spot to enjoy really great aperitifs like Campari’s and Negronis paired with delicious bar snacks. I really liked the European-style decor of Barnacle with its copper-topped bar, pretty blue and white pattern tiled walls and rustic baskets filled with colour popping packets of Lays. Furnished in dark antique wood, cosy dim lighting and adorned with souvenirs collected from around the globe, Stoneburner sits somewhere in-between an English pub and an Italian brasserie. Chef Jason Stoneburner’s venue focuses on stone hearth cooking with brick pressed meats, Mediterranean fare and uniquely topped crusty-yet-thin pizzas. Up next, PART 3: 48 Hours in San Francisco coming soon.